Citation styles for essays and formal papers are largely determined by the discipline or field for which the paper is being written. Although the list of citation styles is relatively long, most papers fall within the guidelines of these three major styles. If you need help downloading the printables, check out these helpful tips. 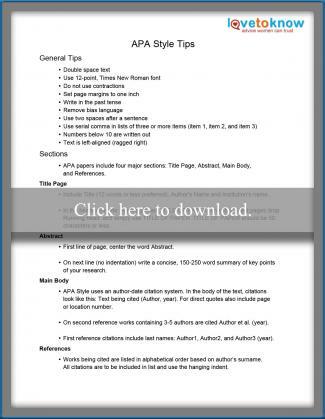 Download APA citation style tips. The American Psychological Association (APA) editorial style was developed 80 years ago and is the preferred writing style of the social sciences and the field of psychology. The goal of the writing is to present research in a bare bones method to alleviate bias and confusion on what the research has revealed. 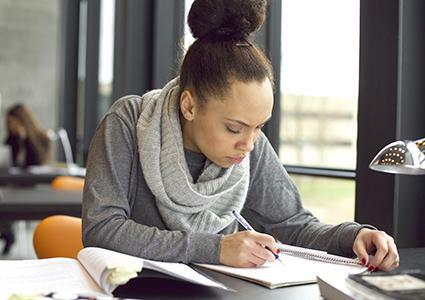 Its 'just the facts' style of writing removes personal anecdotes and subjective reasoning, letting the reader focus on the study or research described in the paper. Part of the reason for an abstract is so a reader can quickly ascertain the main points of the paper, allowing them to decide whether or not to read the entire document. Unique to this style is the running head and a preference for a digital object identifier (DOI). Inside the header, place a shortened version of the paper's title, flush left, in all capitals letters. This title appears on all the pages (with 'Running head:' preceding it on the title page) and it cannot exceed 50 characters, including spaces and punctuation. When using Internet documents, when available, always include the DOI. Here is how you format the various types of references that will appear in your essay, starting with sources pulled from the Web. When the cited source takes up more than one line, use a hanging indent beginning with the second line. Most of the common errors in APA style deal with references and how they are cited inside the text. APA has some very specific rules on citations. For example, if a work you are citing has two authors, then in the main body of your paper you would connect the authors with the word and. However, if you are citing them inside a parenthesis you use the ampersand (&). Incorrect use of headings. First level headings are centered, second level are flush left and third level are indented. There are also capitalization rules that apply to headings. If the number begins a sentence, spell it out. For large sums use a combination of numerals and words: 1.5 million dollars. To learn more about the style, visit this online tutorial provided by the APA. 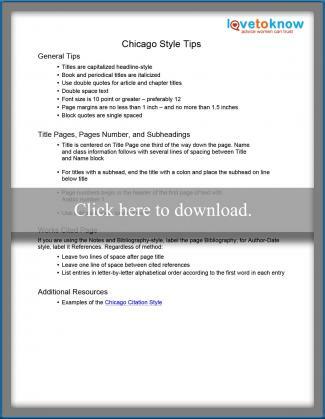 Download Chicago citation style tips. This editorial style can be divided into two basic documentation sub-styles. The Notes-Bibliography System, which is primarily for literature, history and the arts and the Author-Date System used for science and social sciences. A few of the elements unique to the Chicago style is the 'looser' approach to a paper's look. Whereas the other writing formats demand a 12-point font, the Chicago style simply requires a minimum of a 10-point font. The margin is also more relaxed; one to one-and-one-half inch margins are acceptable. Specific to the style is the use of headline-style capitalization for titles and italicizing books and periodicals titles while article and chapter titles are placed inside double quotes. Since the Author-Date method of the Chicago citation styles uses a numbering system for its references, the reference page will include those digits. Here are examples of a few common citations in both the Notes-Bibliography and the Author-Date systems. 1. Ephron, Nora. I remember nothing, and other reflections. New York: Alfred A. Knopf, 2010. Ephron, Nora. I remember nothing, and other reflections. New York: Alfred A. Knopf, 2010. 8. Laurel Leigh, "We Should Do Something," The Sun 463 (2014): 26. Leigh, Laurel. "We Should Do Something." The Sun 463 (2014): 26. Incorrect spacing at the end of a sentence. Chicago style uses only one space after a period, question mark, colon, or semi-colon - not two spaces like most people were taught in typing or keyboard courses. Forgetting to use serial commas. Incorrect format for age. For example, "the girl is ten years old." Not, "the girl is 10-years-old." For a more comprehensive look at the style and its citation guidelines visit Purdue's online writing lab. 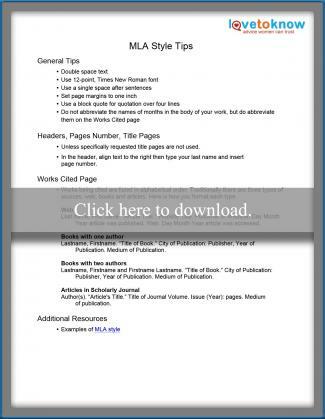 Download MLA citation style tips. The Modern Language Association (MLA) style is easy to learn and is a good general purpose style when no style is specified. Brevity and simplicity describe this style and this is evident when documenting sources. The goal is to document the sources without interrupting the flow of the reader. This is done by citing most sources with only the author's last name enclosed by parenthesis. Since the document does not have a separate title page, the body of the paper begins on the title page. In some ways, it makes the title/first page cluttered. On this page, the author's name and class information is placed, double spaced, in the upper left hand. The title is centered and written in title case. Flush right and inside the header is the author's last name with the page number. Here are a few examples of common citations you will use when writing an essay in this style. Remember, if there is a more than one line for a reference use a hanging indent, beginning with the second line. For short quotes, place quoted text between double quotes instead of a block quote format. For a more in-depth look at the MLA citation style, visit Cornell University's Citation Management site. This style is a condensed version of the Chicago style created for students by Kate Turabian, a former dissertation secretary at the University of Chicago. This method relies heavily on The Chicago Manual of Style. Citation-sequence system, where each source cited in the paper is given a number the first time it appears in the text. Anytime the source is referred to again, the text is marked with the same number. Citation-name system, where the list of references is first arranged in alphabetical order and then the entries are numbered in that order. Those numbers are used in the text to cite the sources from the list. Two easily accessible tools on the Web that can reduce your workload are templates and style generators. While it is true that if you always write in the same discipline an in-depth knowledge of the preferred citation style can make the editing process much simpler, if you write across several disciplines there are tools to help.